New from Concept2, the SkiErg offers total-body exercise using motions from the sport of Nordic skiing. Using the same mechanics and electronic monitoring systems as the Concept2 Indoor Rower, the SkiErg helps build strength and endurance by working the entire body in an efficient, rhythmic motion. The SkiErg offers terrific exercise for the upper body, core and legs. Each pull starts with arms and shoulders, then involves the core muscles in a downward "crunch" and finishes by engaging the legs. The electronic Performance Monitor self-calibrates and displays immediate, accurate feedback. The Pilatesstick® is a space-saving, inexpensive way to offer equipment-based Pilates in fitness facility. Developed by an exercise physiologist, the Pilatesstick® is a professional-grade, portable exercise system that allows participants to do a majority of the exercises usually reserved for the traditional Pilates tower and reformer. Pilatesstick® exercises are designed to build core strength and improve balance and stability while challenging the extremities in movement. It may be used in all positions: supine, prone, kneeling, sitting and standing to create strength, stability and flexibility in the body. The Life Fitness ElevationTM Series includes the newly designed 95T Treadmill, 95X Elliptical Cross-Trainer, 95C Upright Lifecycle® bike and 95R Recumbent Lifecycle Bike. The products are offered with the EngageTM , InspireTM or AchieveTM consoles. The Engage and Inspire consoles feature iPod® integration, USB connectivity to create and store workout data, and a Virtual Trainer. Users can also view video from the Engage console's integrated screen, or from an optional 17-inch attachable TV on the Inspire console. 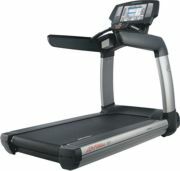 The AchieveTM console features an LED display, and the six most commonly used Life Fitness workouts. Balance training is an important part of core strength, vital to how our bodies relate to the physical world. It also adds a level of difficulty to many forms of functional training. The new FitBALL® Deluxe Board has an extra-large surface—ample room for full-body training. The heavy-duty plastic construction is designed for high-use fitness and rehab facilities. With a fulcrum height of 5 inches, the multidirectional base offers balance challenges for both beginners and advanced users. Six slots around the edges of the board are ready for use with your resistance tubing. Fit Interactive® provides revolutionary fitness games to activate people of all ages and fitness levels by engaging the competitive spirit. They apply proven physical training applications with sensory stimulation. The use of lights and sound engage the senses, improving sensory perception, mental acuity and reaction time on top of great strength and cardio. Effective training…Games for Life!TM Products include: HeavyBall, JumpQ and 3Kick (pictured). Reacting to light and sound, user strikes one of nine targets with hands or feet, triggering another pad to light randomly. One to three players. The Raptor Series, endorsed by Lee Labrada, is among the industry's most powerful strength training equipment. With a full array of upper and lower body exercises and a sleek, space-efficient design. ProMaxima's top-of-the-line strength training series makes it easy to achieve maximum results. All Raptor pieces are made to order allowing the flexibility to make it any color combination. 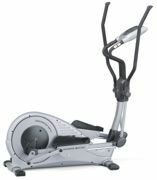 ProMaxima's next generation of Ellipticals are built to perfection and to withstand any heavy commercial workload. Its easy operation with a dependable, sturdy design ensures years of high-level performance. The BioStride motion on ProMaxima's Elliptical features a true natural stride. Optional entertainment package available. Since 1949 Kettler® has been producing high-quality products built to last. The Kettler® EXT7 sets the bar higher once again. The EXT7 boasts a solid and silky smooth feel with its eddy-current magnetic resistance and hefty drive system. The EXT7 offers numerous preset programs included, as well as automatically adjusted heart-rate control technology. The kôrTM Kettleball is an attractive, user-friendly alternative to cast-iron kettlebells for group exercise or personal training. This unique, non-scuffing kettleball is sized for consistent technique development and features a 1 1/4-inch durable, molded handle for a solid grip and smooth rotation. Fits standard kettlebell racks.